﻿Continuing with the birthday party which is today...I needed to make a card to go with the cupcake toppers. And it needed to be big enough for everyone in our department to sign it. 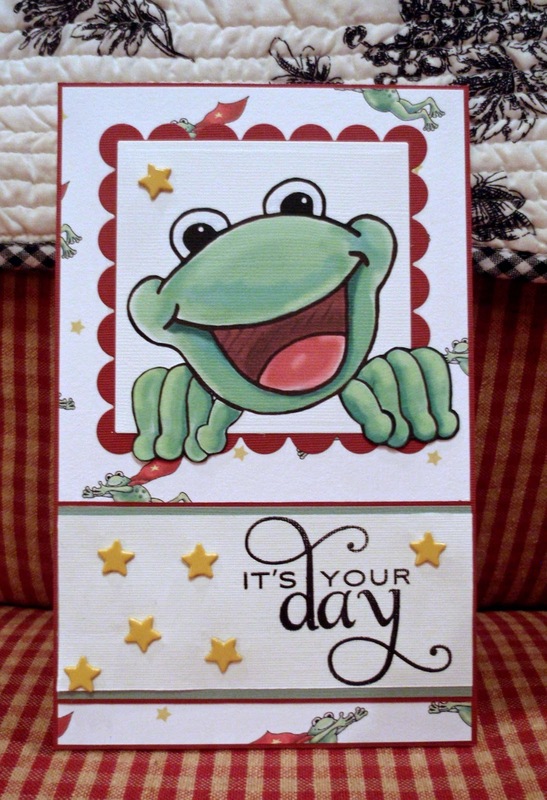 To start this card, I edited the frog image twice. On the first image, I removed his hands. On the second image, his hands were all that remained. I used the largest square and scalloped dies from Spellbinders to cut out and mat my focal image. First came the square with the frog's head on it. Then I cut around the hands from the second image. I glued the hands back in place and this time they crept over the edge of both dies. 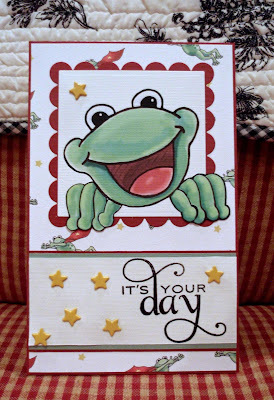 I used the little flying frogs from the cupcake toppers and made some background paper for the card. Then I added some star brads and a stamped sentiment. I am going to call it DONE! So happy birthday to William. I'll be back tomorrow with something fresh.